The robust feeding hopper Palk is indispensable for processing dough. It is installed above the divider, where it feeds uniform quantities of dough, ensuring the optimal operation of the divider. The hopper is made of stainless steel, and the inside is coated with Teflon, which prevents the sticking of dough. There are two rotating triple-sided blades beneath the hopper to ensure uniform feeding depending on the length of the blades and type of dough. 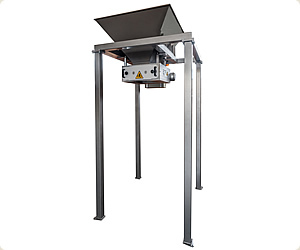 The height of the feeding hopper is set according to the height of the divider. The machine has two photocells: one is intended to control the maximum amount of dough in the divider - when the set height is reached, the hopper stops feeding; the other photocell in the hopper triggers a yellow light if there is a minimum amount in the hopper. It is also possible to set the quantity of pieces fed into the divider.